"I'd be lying if I said the only reason I didn't want Jimmy to start shooting was because he'd end up like Gramps. You know, there was a sick part of me that wanted to know how it would feel and, most of the time, it was that part that was running things." MPAA Rating: R for strong and continuous drug use, language, sexuality, and violence. God forbid, should you ever become seriously injured and require emergency assistance from paramedics, it would be troubling to think that those paramedics would be serious drug addicts. Scott Ziehl's second directorial effort (his first was as co-director of 1996's Squanderers), Broken Vessels, is just the film to spawn this concern in your mind. Wet behind the ears, and just into town from Pennsylvania, Tom has applied for a position as an ambulance driver. With some reservations toward Tom's lack of ambulance experience, and having assigned him the nickname "Tuna Fish" (after Tom's hometown of Altoona), the ambulance company manager hires him and assigns him to work with Jimmy, one of their most experienced paramedics. Jimmy, as per the cliché, is a loner who has already gone through several partners. As Tom discovers in his first few days on the job, Jimmy is a man who embodies the "four C's"; confident, cool, collected and competent. Despite his excellent skills, however, Jimmy is also not particularly prone to playing by the rules. At first, they are relatively minor indiscretions, drinking beer in the ambulance, bar hopping on duty, and smoking a little grass. With the added influence of a couple of attractive bar floozies, Jimmy lures Tom into his hedonistic lifestyle in almost no time. Tom soon becomes acquainted with "Gramps", the man who raised Jimmy and who now resides in a retirement home. Jimmy stops by several times a week and gives Gramps his intravenous heroin fix. Tom's new lifestyle gets him in the skids with his square roommate and he ends up moving in with Jimmy at about the same time that he starts smoking heroin with him as well. The downward spiral begins. As Tom's level and frequency of drug use escalates, his job performance and social life deteriorates. He meets an attractive and intelligent young nurse whom he wines, dines, and romances but never calls again. He starts to hang out with Jimmy's neighbor, Suzy, an amphetamines addict. We learn, through a series of brief dream sequences, that Tom is haunted by a past that included alcohol abuse and fatal drunk driving incident. Tom does experience a brief moment of clarity when Jimmy begins stealing from their clients to pay for drugs, but his effort to shake the monkey from his back fails. When Gramps passes on, Jimmy and Tom switch to intravenous heroin themselves and their downward spiral tightens and escalates and a sudden and vicious crash becomes inevitable. Broken Vessels starts off in a rather pedantic fashion, with a screen advertising the awards that it has won. To be specific, it won the Grand Prize at the Los Angeles Independent Film Festival, was nominated for Best Foreign Film at the British Independent Film Festival, and was an "Official Selection" at the Toronto International Film Festival. The film was clearly shot on a very tight budget. The ambulance used in filming is of an old style hardly ever used by ambulance companies nowadays, especially those in large metro areas. Some of the sound effects are extremely poor, with the defibrillation sound effect used at an early accident scene being one notorious example. On the other hand, Ziehl generally succeeds at getting pretty good mileage out of his limited resources. The use of high-speed traffic footage as symbolism, for example, is a very nice touch. The performances from the film's two leads, London and Field, are both very sound. Field may be recognizable to many viewers from his role as Nick Nightingale in Stanley Kubrick's Eyes Wide Shut. 27 year-old Jason London has benefitted from some notable big screen exposure as well, with roles in Dazed and Confused and Too Wong Foo... . Patrick Cranshaw plays Gramps, and his dramatic scene with Tom near the film's end is the best that this film offers. Susan Traylor is effectively jittery as the speedhead neighbor, Suzy and the ubiquitous James Hong is competent as Mr. Chen, the ambulance company manager. Lastly, Roxana Zal, who plays Tom's brief love interest in the film, also serves as one of the film's producers. Showing the horrors of substance abuse in an unflinching manner has become very popular in the film world, as of late, with Leaving Las Vegas and Gia being two recent examples. 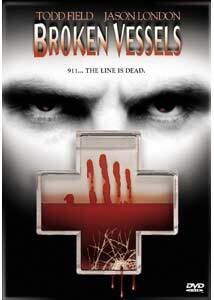 Unfortunately, Broken Vessels doesn't offer us much of anything we haven't already seen done before and done better. The solid performances from the film's leads can not overcome some rather trite writing, the clumsy use of narrator voiceovers, and one too many cliches. The relationship between Tom and Elizabeth, for example, is never properly fleshed out and the dialogue between them wooden and unconvincing. Despite its flaws, Broken Vessels does, for the most part, succeed in being engaging. Ziehl may prove to be a major new talent as a director. Todd Field's solid work both here and in Eyes Wide Shut make me want to see more of him. Hopefully we will. Image Transfer Review: The image transfer for Broken Vessels loses points right away for not being anamorphic. Despite this, it actually does possess a fairly good letterbox presentation for a low-budget indie film. The picture is very crisp with only slightly muted colors. The indoor shots look just as good as the outdoor shots. Graininess is only very occasional. The image does exhibit some very mediocre black level distinction in some scenes, but this should not prove to be terribly distracting. Audio Transfer Review: Like the image, this disc's 2.0 stereo transfer is pretty respectable for its low budget origins. In a few scenes, the background music kind of steps on top of the dialogue, making it hard to discern. Extras Review: This disc is pretty light on extras but the six additional trailers are kind of a nice touch. I was unfamiliar with five of the six films but, after watching the trailers, there are a couple I will probably look into viewing. All seven trailers, like the film, are presented in 2.0 stereo. Cast and crew bios are offered, but not filmographies. Unfortunately, no subtitles or captions are included. On interesting glitch I discovered is that the scene access only lists 12 scenes. However, my chapter navigation buttons indicate 14 chapters. Broken Vessels does have its share of weaknesses, but some solid performances from its leads help it overcome some weak writing. Dark and depressing, it does often succeed in being engaging and may be worth a look for fans of independent film.